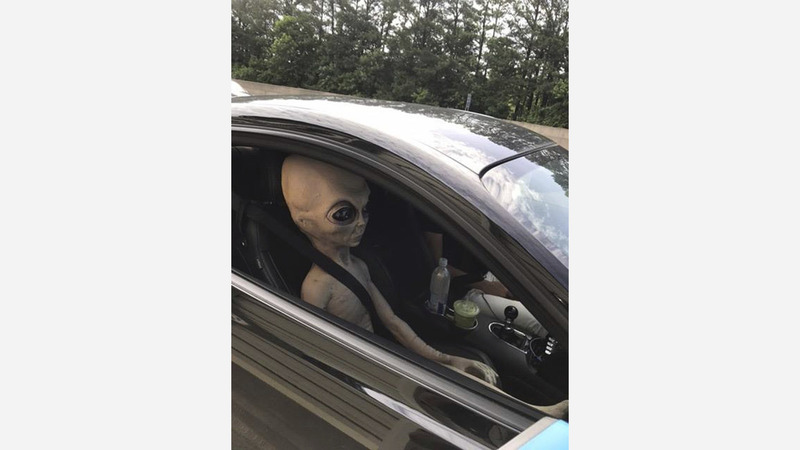 ALPHARETTA, Ga. (AP) - Police say a motorcycle officer who stopped a driver for speeding on a suburban highway north of Atlanta had an 'extraterrestrial encounter' - sort of. George Gordon, a spokesman for police in Alpharetta, says that when the officer pulled the man over Sunday, a life-sized doll of a big-eyed, large-skulled alien was riding in the front passenger seat. The Atlanta Journal-Constitution first reported the encounter, saying the driver was clocked at 84 mph (135 kph). Not quite warp speed, and Gordon later told The Associated Press: "He did not mention as to 'why' he had an out of this world passenger." The driver got off with a verbal warning - and some laughs from the officer - who took photographs of the safety-belted alien police later posted on social media.